Ruadhán was the founder of the monastery of Lorrha (or Lothra) in north Tipperary, fourteen kilometres west of Birr, Co Offaly. A number of monastic ruins can still be seen in the village. The image (to the left) is from a set of paintings of the twelve apostles of Ireland in the church of St Finian in Clonard, Co Meath. Patrick Duffy puts together the stories about him. Ruadhán is said to have been the son of Fergus Bern, son of Dera Dubh, of the race of the kings of Munster. He studied and was ordained at Clonard. According to the Bethada Náem nÉrenn he had a foundation at a place called Musccraighe, in Ara Mac Ua Neitt, before he moved to Lorrha. There are stories of disputes between Ruadhán and Brendan of Clonfert, who set up a monastery near to Ruadhan’s, but when the monks of Lorrha protested, Brendan and his monks decided to move on. Another story tells that Ruadhán cursed the kings of Tara so comprehensively that their influence declined and their high places were abandoned. Despite the evidence of these conflicts, Ruadhán was highly regarded. His monastery was said to have had 150 monks with a reputation for prayer and manual labour. One story makes Ruadhán a friend of Colmán Elo, who had a foundation at nearby Lynnaly (Lann Eala). A hind used to come each evening to Lorrha to be milked by Ruadhán, and then run to Lynnaly for a morning milking by Colmán. Another story makes him a friend of the saoi liag or master physician Aed Mac Bricc of Killare, Co Westmeath. It may also be that Maelruain (servant of Ruadháin) had some connection with Lorrha, or that he was simply called after him. Ruadhan’s hand, enshrined in silver, was preserved at Lorrha until the Reformation time, when it was lost. His bell is in the British Museum. Lorrha is a good example of an early monastic site that was taken over by the Normans in the 12th century and subsequently developed into an Anglo-Irish borough. 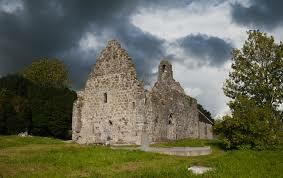 There are a number of ruins – of the Celtic foundation and of later Augustinian and Dominican foundations. Today both the Catholic and Church of Ireland churches in Lorrha in the diocese of Killaloe are dedicated to St Ruadhán.